Why Are Insecure Overachievers at Risk for Many Health Problems? Competencies, skills, achievements, certain personality traits – all of that plays a role in a job interview. However, the most prestigious companies are looking for the one more personality trait that we may overlook – it is the insecure overachiever. A lot of companies prefer young, hard-working perfectionists who would do anything to climb the company ladder. They are looking for talented, skillful, well-educated, and driven employee. Insecure achievers differ from other employees by a strong drive that is rooted in fear. The insecurity driven people will push them to exceed their emotional, psychological and physical limits to bring expected results. To make things worse, statistics are depressing. Insecure overachievers do not last long. Usually, they may experience burn out and/or get big health problems. 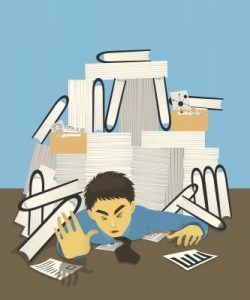 To find out if you are why insecure overachievers at risk for health problems, the article “14 Signs Your Perfectionism Has Gotten out of Control” gives us the list of traits. 1. You’ve always been eager to please. 2. You know your drive to perfection is hurting you, but you consider it the price you pay for success. 3. You’re a big procrastinator. 4. You’re highly critical of others. 5. You go big or go home. 6. You have a hard time opening up to other people. 7. You know there’s no use crying over spilt milk… but you do anyway. 8. You take everything personally. 9. … And you get really defensive when criticized. 11. The image below makes you nervous. 12. You take pleasure in someone else’s failure, even though it has nothing to do with you. 13. You get secretly nostalgic for your school days. 14. You have a guilty soul. Not only that insecure achievers are at significant health risks, but they also have a poor happiness level and are usually dissatisfied with their private life. They live in fear. Fear is their fuel and they have not learned how to be content. They are accustomed to pursuing their goals, and once they achieve them, they immediately look for another set of goals. They do not celebrate their success. They are always in search of more. Insecure overachievers believe that they should show other people how special they are because their inner pain is that they are not good enough. This vicious cycle cannot last long. Sooner or later it takes its toll and undermines their health. Insecure achievers who are aware of the health risks may decide to change negative inner beliefs and choose to live more content life. Tags: Why Are Insecure Overachievers at Risk for Many Health Problems? Next story Why and How to Cultivate Compassion?